City of Colonia Clunia Sulpicia, Coruna del Conde (Penalva de Castro, Burgos). 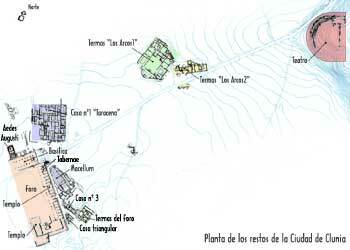 Plan of the city of Clunia with its most outstanding remainings. City of Clunia was founded by Tiberius on a new settlement since population was originally set in a different place. It was an Arevacan oppidum and later, a Roman city under Augustus Emperor. Scholars have proved that Arevacan village suffered several sieges -Pompeius, Metelus and Afranius- before being conquered. Tiberius gave the village the honour of municipium and, as has been said, he gave it a new place: the top of a little hill called the "High of Castra". At Claudius age, it became the capital of a legal convent: it included a great part of Peninsular northern-center. Most important historical deed was made by Galba. At year 68, he was Governor of Hispania and an enemy for Emperor Nero. Because of frequent revolts at the whole Empire, Galba found shelter at Clunia. There he knew that Nero was dead and Galba himself was created new Emperor by the Senate. The city that protected him received the honour of being called "Colonia Clunia Sulpicia". The city's surface was about 120 has. though it is not easy to establish its limits, streets, existence of walls and many other elements because of difficulties in researchs and remainings found on excavations. 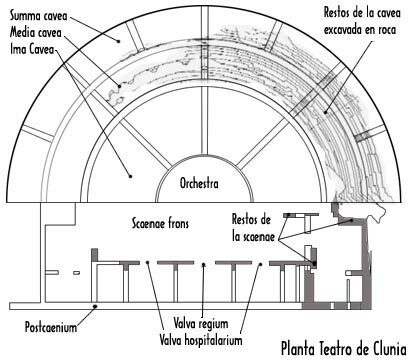 Plan of the Roman Theater in Clunia. The Theater: It is placed in a good point in order to take advantage from the slope of the hill on which the city was set. There, the semicircular cavea was excavated and the rows directly set on the rock. The whole summa cavea and the media cavea were totally made in this way. Only the ima cavea have been structural works for restoring it. Maximum diameter for this row is 95 m. It could contain more than 9.000 spectators, being one of the biggest on Peninsula. At its low part there was a semicircular Orchestra with a diameter of 25 m.
From the whole Scaenae it just survive some concrete remainings of its Scaenae frons. Building of Theater was previously used as a quarry for close buldings. Then, it has been often spoilt. Anyway, disposition of still standing concrete rectangular buttress makes us imagine the original form of this outstanding Scaenae frons. The building construction dates from Tiberius Emperor age. General preservation state is not good, but sizes and volumes of this Roman Theater can be calculated in an approximate way. Domus of Taracena. It is the greatest of those that have been already excavated. Its distribution is not clear, because of the different changes it suffered along its useful existence, since 1st century to 4th one. It has mosaics and underground rooms. Domus nº1 It is placed close to the comitium and has been just partially explored. Many of its rooms may have been spoilt when comitium was built. Its southern side shows private termae. Triangular house. Today, only a small part is excavated and we know not too much on its distribution. A market or macellum. Scholars do not know clearly which was its function, though it is supposed to have been a market. Its shape of bottle makes it curious. The entry was made through a portico with four columns. A surrounding peristylum would have existed, as can be seen through basements parallel to the exterior wall. Its Basilica, had three naves and was open to the comitium through a series of columns. Its central nave was disposed for a tribunal. It is placed at the northern bottom of the comitium and it occupies the wide part of the whole. Tabernae or public shops would occupy both longest sides of the comitium. Threepiece temples were placed at the lateral center, between the tabernae. They occupy the place of three of them. They were covered with marble and decorated with statues. 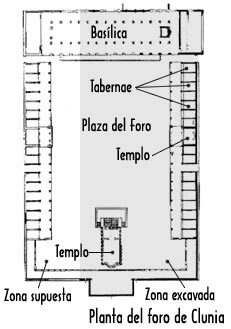 The temple, at the lateral opposed to the basilica is placed on a podium communicated through lateral stairs placed at the back façade. It has a rectangular plan with an apse. At its best age, this city could have lodged up to 50.000 inhabitants. The end of this city should have been about 5th century, though a small recession can be seen at 3rd century because of cruel spoilts and sackings of Barbaric tribes.